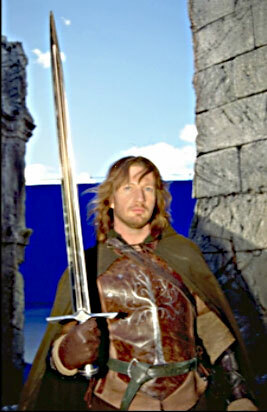 Faramir's clothes and armor were in the room that was the set of Osgiliath. I can't explain how amazing it was to stand there - it was past the recreation of the waterfall in Henneth Annun, and required walking through a passage under the broken bits of the city above. 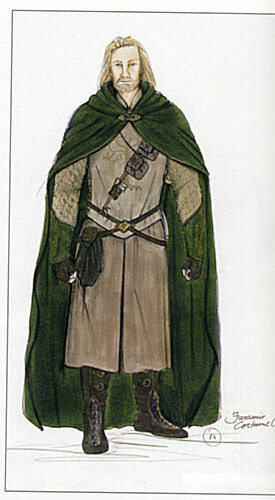 Osgiliath looms large in my personal mythology, and it rivaled the experience of standing in the Window on the West. 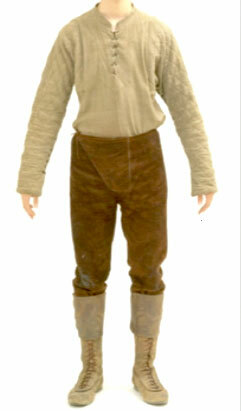 There was a hint of soft natural linen showing at the edge of his neck, just above the curiass, edged with a little scrap of taupe colored material. 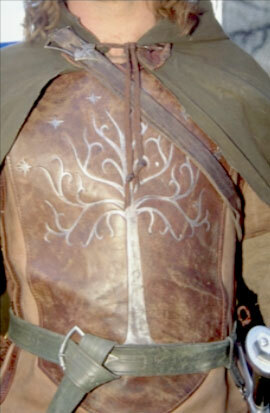 The tree is open at the top, no star, no heart like the weapons. 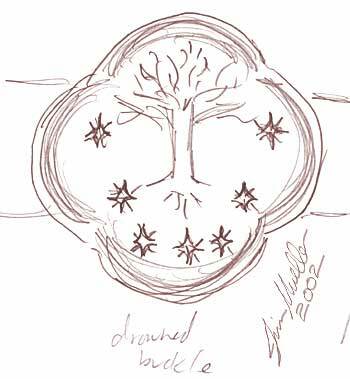 At the top of the curiass (over the throat chakra) was appliqued a diamond of leather with an eight pointed star. 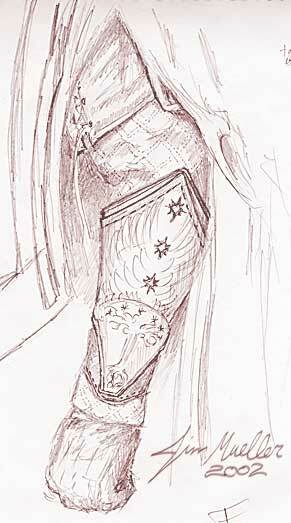 The curiass is worn, especially just above the waist on the left where the pommel of the sword probably rubs when he sits or bends. The color is rubbing off the white tree in the bends. 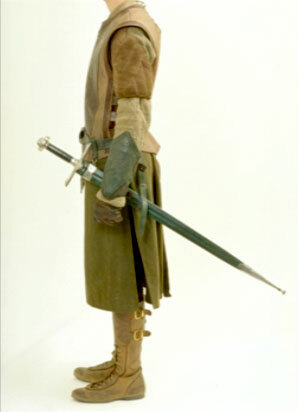 The "skirt" of the green inner coat is not leather, it seemed to be a soft wool. 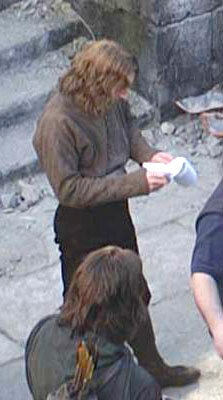 Chris and I kept whispering to each other - we should not be in Osgiliath - but Oh My God! 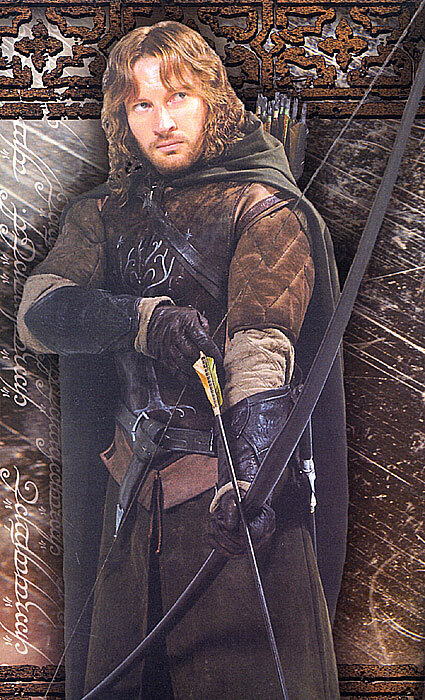 We're in Osgiliath! 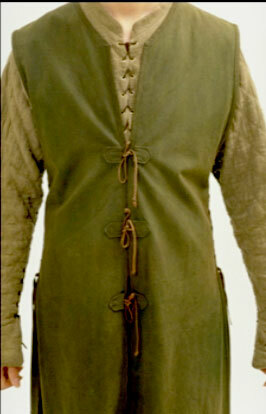 The first two days we were at the exhibit, Faramir's cloak was closed and there was no getting a good look at his gear. 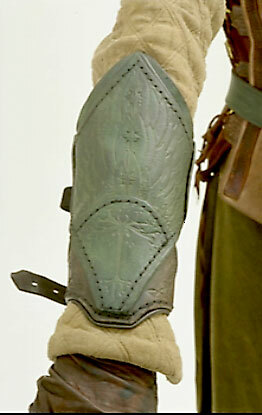 I was trying to peer through is cape to see the bracers, but all I could tell is that they were a dark green. 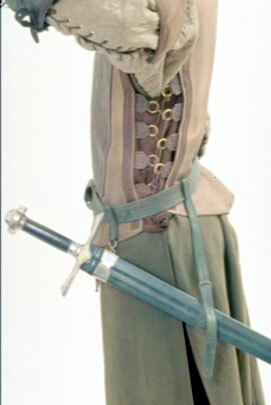 On the third day, Anrica - one of the lovely and friendly museum staffers I met - was teasing me in the Rohan room and said hadn't I seen enough. 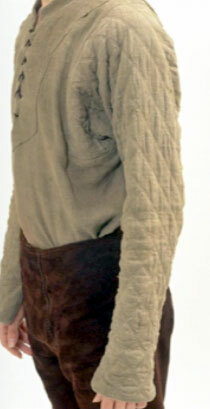 I burst out - "No! 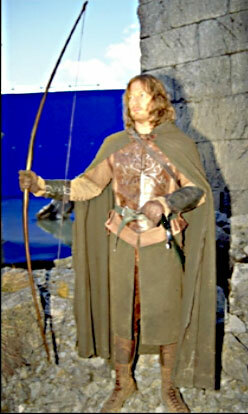 I haven't really seen Faramir's gear at all, it's all covered up." 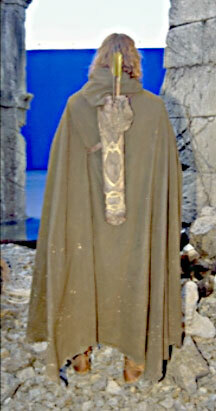 I explained about the cape being closed, and she said - "Don't people want to see that?" "I certainly do!" 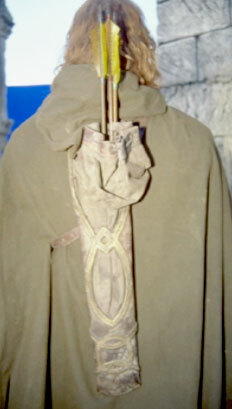 I said - and she led me down the back way through the exhibit, got on the headset to annouce she was stepping into the display, and folded Faramir's cape back on the left side, and angled his gear a little better so I could see it over Frodo and Sam's clothing. Thank You, Anrica! You made my trip unbelievably wonderful. 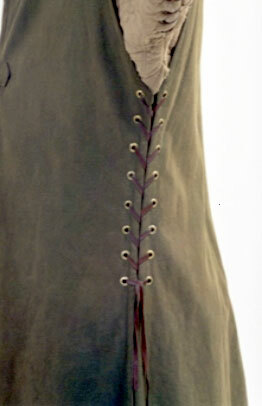 Lacings under the arm and on the sleeve of the inner coat. 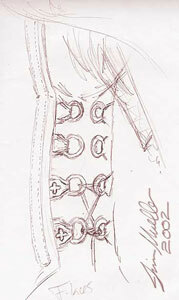 Each side of the leather breastplate /curiass has four pair of rings from the underarm to the waist. 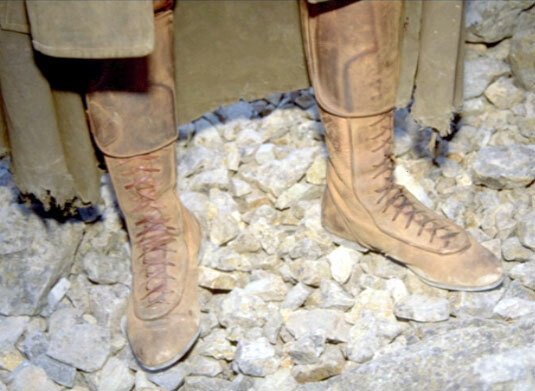 In the exhibitm they were tied in sets of two pair. 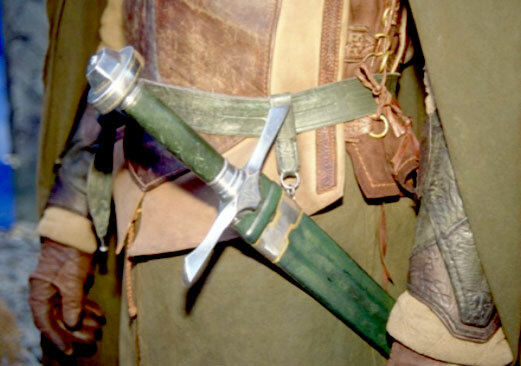 There are four-lobed symbol on the leather bosses - not a cross -perhaps a flower? (Anrica stepped into the exhibit and drew them for me.) 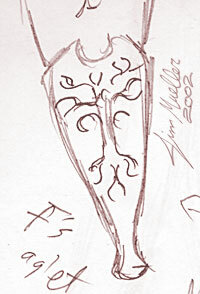 Not a very far stretch to see the simbelmynë petals here, but that is a very speculative ides. 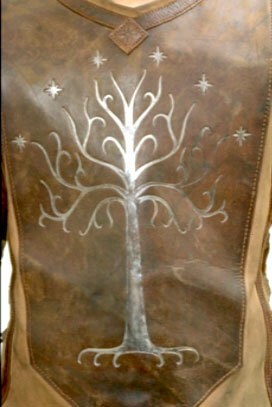 This buckle was on a drowed Second Age Gondorian warrior - now the tree has leaves. 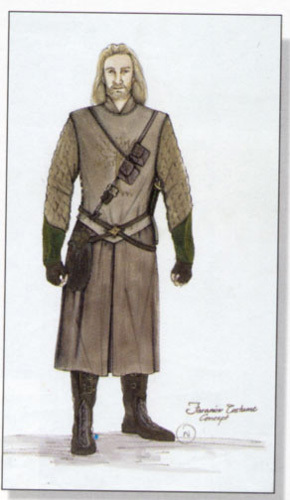 There is another version of the tree that seems to be on the Guards uniforms - more stylized, very art deco - still showoing leaves, though. 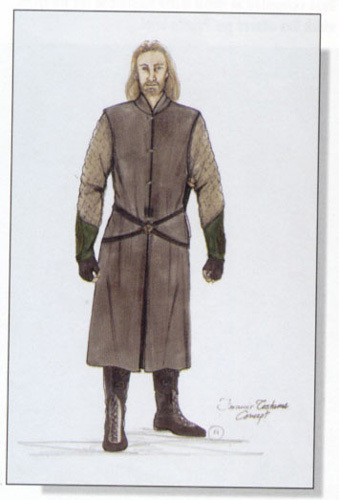 The sketches that show the stages of Faramir's outfit are from The Art of the Two Towers. 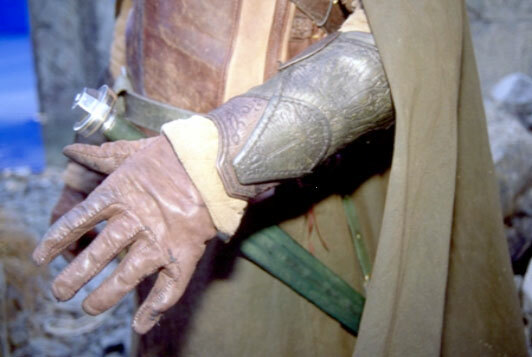 This is the buckle of Faramir's quiver- it seems very plain, but I soon figured out from the spacing of the marks that it represents the seven levels of the city, with the large expanse of the Pelennor at the front. 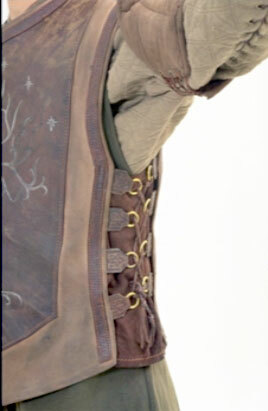 The tongue of the buckle lies just where the shipwall should go. 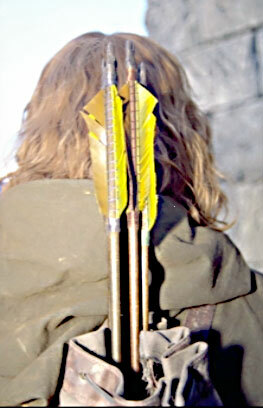 The quivers themselves are only a hard, supporting leather about half way up - just a "cup" to hold the arrows. 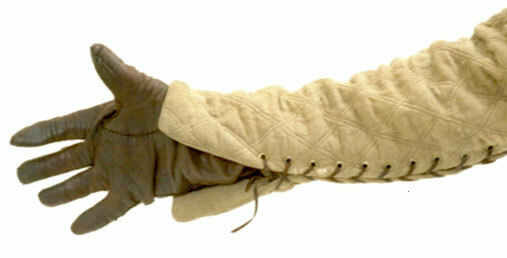 The soft material insert can be opened and pulled down to clear the arrows for use. 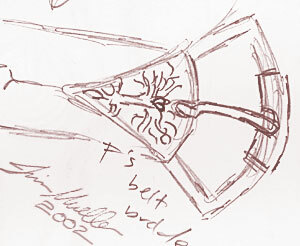 This etching appears on the boss of Faramir's sword, at the hilt. 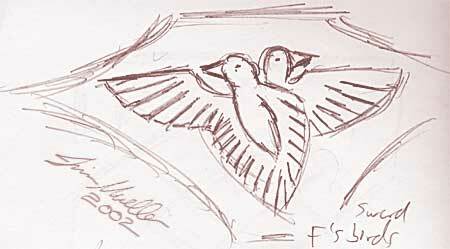 Two birds, each with an outstretched wing - I assume they are part of the seabird motif of Gondor. 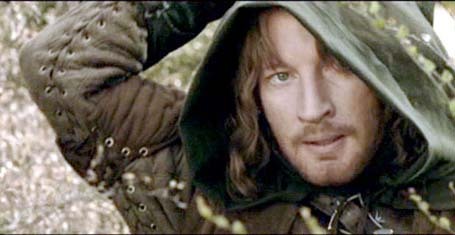 Since I have always thought of him as The Raven of Ithilien, I was very very moved. 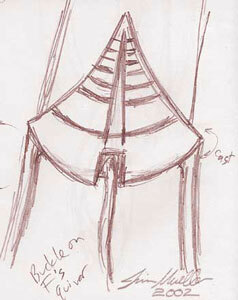 The outstretched wings and tail make a sort of triskell shape. 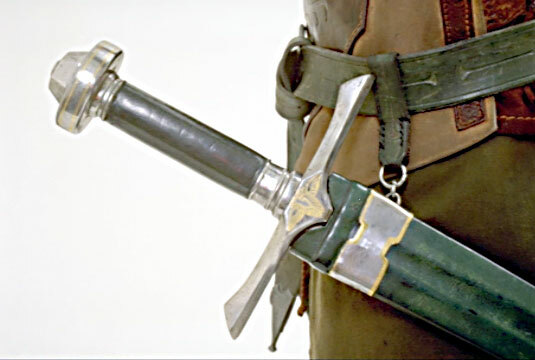 The hilt of his sword is really scarred and dinged- the grip showed the soft wear of his hand, but the metal of the haft is really scarred - small, but very visible. 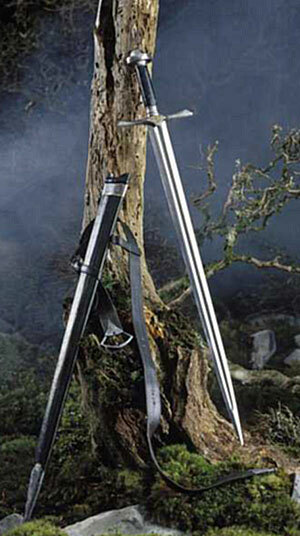 The Gondorian Longbow - According tothe new Weapons and Warfare book, the Captain's Longbow has a 150 pound pull - for the few seconds the bow is held back, the same as lifting 150 pounds with those two fingers. 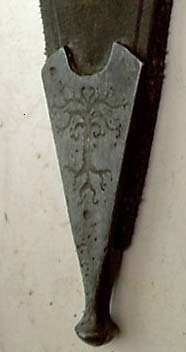 This is the head of a Gondorian spear - there was a row of them in the cave of Henneth Annun, The pattern on the spear head is raised instead of embossed this time, but once again it seems to represent the seven levels of the city and the shipwall that runs through it. 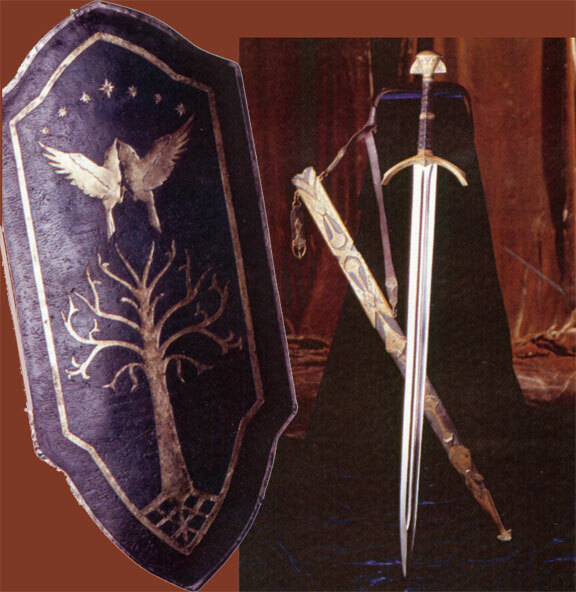 I love the way the two Seabirds of Elendil the Sea-lover are placed beak to beak, toe to toe to form the picture of the Winged Crown of Gondor.